Exercise classes run by the ESBT falls and fractures service aimed at increasing stability and coordination are working to significantly reduce the likelihood of falls for those deemed at risk. 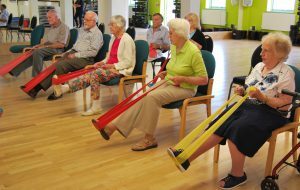 In October 2016, the Joint Community Rehab team (JCR), run by East Sussex Healthcare Trust (ESHT) and East Sussex County Council, launched a programme of strength and balance exercise classes to support those who are at risk of falls. The classes are hosted by local leisure centres and run by their postural stability (PSI) qualified staff and falls practitioners from ESHT. Leading the way in East Sussex, the programme is funded by East Sussex Better Together and supports many of its main aims such as prevention, integration and supporting community-based care and support. The safe and effective group classes give people the independence they need to manage their own health and wellbeing and help to keep them active in the community, whilst also helping to combat social isolation. Teams from across health and care are working together to provide the service, alongside local leisure organisations, with patients being able to self-refer through a single point of contact (Health and Social Care Connect). 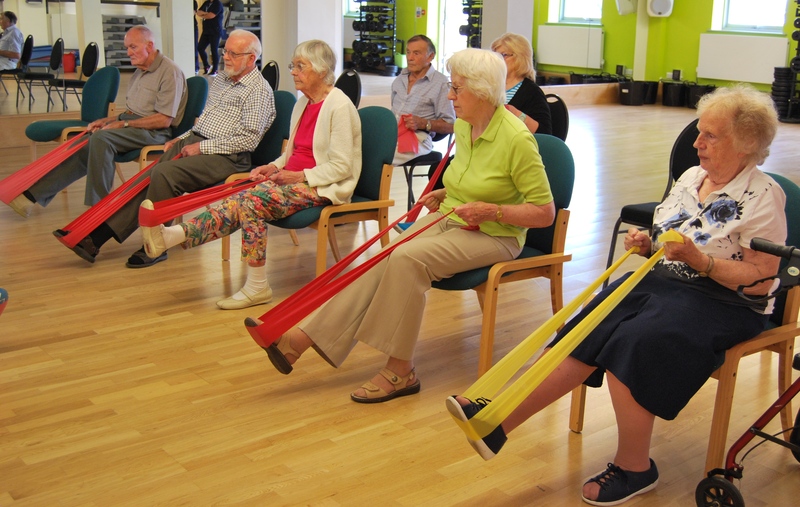 The programme follows recommendations made by Public Health England in the Falls and Fractures Consensus Statement which shows strength and balance exercise provision has previously proven to reduce the rate of falls by up to 32% and the risk of falling by up to 22%. Clients who are very frail, housebound, or who have trouble accessing the exercise classes are offered the Otago programme to do at home, which has also been proven to successfully reduce falls risk. The hour-long classes take place over 17 weeks, with participants encouraged to do at least two hours of prescribed exercises a week at home. Once participants have completed their classes, they are assessed, encouraged to keep up their exercise routine and offered a follow-up phone call. The falls service is also working with Locality Link Workers across the patch, who are a great source of local knowledge about fitness and stability activities for older people who have completed the courses, to help them to maintain the benefits gained once they finish. Anybody who has had a fall or a near miss, has a fear of falling, significant impairment of balance or an identified risk of falls, can self-refer by contacting Health and Social Care Connect or can speak to their GP for more information. Once a need for support has been identified, potential clients are either regarded as high risk, or low to moderate risk, based on all the aspects which can affect someone’s likelihood of falling. These include strength and balance, cognition, medication, home environment footwear and sight and hearing risks. 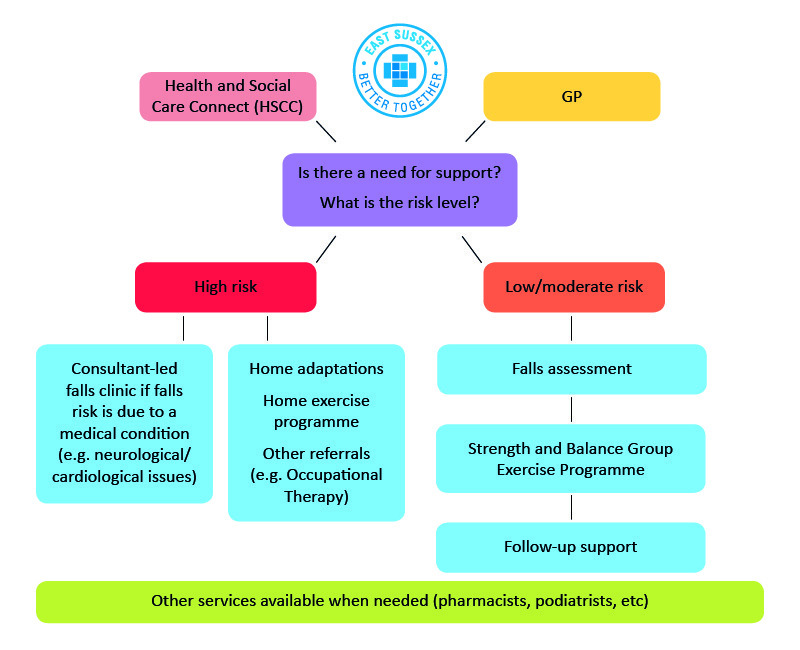 For those at high risk, interventions such as individualised physiotherapy or occupational therapy, home adaptations, medication review and recommendations and home exercise may be offered. For those where an underlying medical condition is suspected to be responsible for falls or blackouts, individuals are referred to a consultant led clinic for further investigations.. Low to moderate risk clients will have a falls assessment and if suitable will be referred for the group exercise programme to increase their strength, balance, co-ordination, functional ability and confidence to ultimately reduce the likelihood of falls and fracture. This entry was posted in News on September 5, 2017 by East Sussex Better Together.